3 strikes and you’re… IN! After I was requested to leave the premises of the US consulate, with an empty passport in my hands, and a dream gone up in smoke, I tried to convince myself that it really was no big deal. I pretend that it was all good and all OK that I was not going to thru-hike the Pacific Crest Trail, if ever. But it wasn’t good. It wasn’t at all. My Dutch friend Eelco Keij, who resides and works in New York City heard about my 2nd rejection and before I knew it, he already contacted with the former US consul (who he had met in person, a year earlier) and mailed her about my case. She was so kind to give him the contact details of the current consul. I was invited back, to apply once more, with the promise that my case would be reviewed by a different adjudicating officer. Further, Eelco and his wife Tracey, made efforts to contact the New York State Senator, Kirsten Gillibrand to tell her about my case. And they succeeded in doing so. 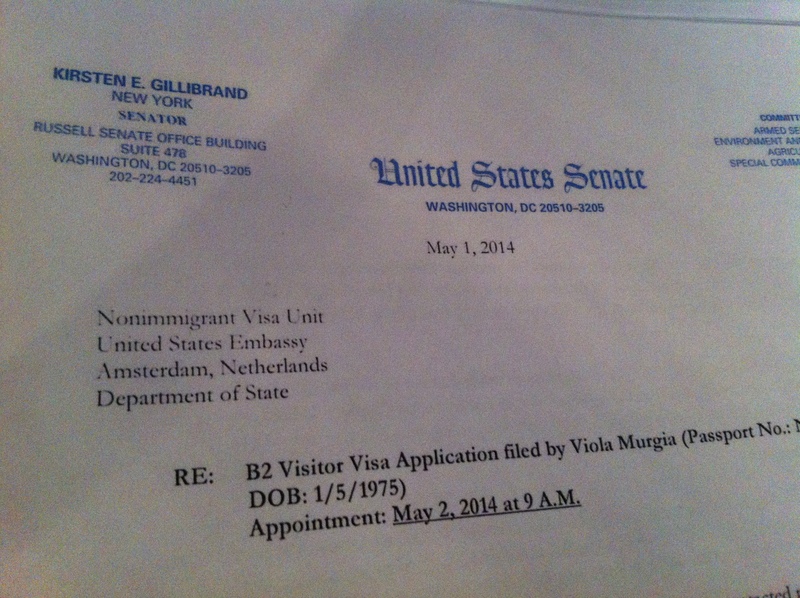 At the day of the interview, I drove to Amsterdam, an official letter from the desk of mrs. Gillibrand with me. The US consulate had already been informed about this letter. I waited patiently in line to enter the US consulate, my 3rd visit in two months time. When I was called in, the interview took over 40 minutes, where the officer who reviewed me, fired one question after another at me. Like I had to defend myself in a crossfire. I was standing in front of the glass window, felt my heart racing like I was running a marathon on the spot, answering all of his questions and in the mean time, trying to stay calm. After the interrogation, I was asked to take a seat and as I waited the officer would make his decision. I waited for more than one hour. And tried to empty my mind. Which didn’t work. Then, I was called back. I looked at the officer’s face and tried to read it, but all I could see was a mask, there was nothing there, no emotion, no empathy. Then he looked at me, and told me my visa was issued. I asked him to repeat it again, because I couldn’t believe what just happened. At home, I checked the website of the consulate, just to be sure that they didn’t make a joke and fooled me. There it was. ← America is giving me the cold shoulder – again. Whoop, whoop! You goooooo girrrl! Really looking 4ward 2 UR adventure! Yes! No country can keep a girl from her trail!